Anyone who closely observes what happens in organizations cannot help but be frustrated by problems that go unrecognized, problems that are recognized but never corrected, problems that are recognized and poorly corrected (band-aids), and the illogical thinking and decision-making that often takes place. In my view, this reflects the limitations of the basic level of critical thinking skills that are taught in higher education, even up to the level of doctoral degree. The image below illustrates the problem. 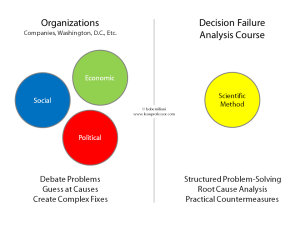 The left side represents the framework for which critical thinking and decision-making often takes place in organizations: economic, political, and social. The common result is time-consuming debates, guessing at causes of problems, and the creation of complex solutions. The right side represents the framework for which more advanced critical thinking takes place: the scientific method. In particular, that means the use of structured problems-solving processes to determine actual root causes followed by the identification of practical countermeasures. Ten years ago I created a graduate course that teaches students an advanced method of critical thinking that uses a new structured problem-solving process called “A4 Failure Analysis.” In recent times, the course has been named “Decision Failure Analysis” and “Failure Analysis of Management Decisions,” reflecting its focus on the thinking and decisions that leaders of organizations make (that includes for-profit companies, non-profits organizations, and government). Leaders’ bad decisions are analyzed scientifically, rather than through group discussion or by using the Socratic method – which many professors are no so good at doing. The intent of the course is to build on the basic critical thinking skills students gained as undergraduates and to develop more advanced critical thinking through weekly application of the A4 failure analysis method. The result of the learning is to avoid the kinds of outcomes shown on bottom of the left side of the image, both immediately and into the future. Most liberal arts faculty do a good job teaching students basic critical thinking skills. While I personally value liberal arts education (both my children received liberal arts education), I think the critical thinking skills developed in most students does not go far enough (though there are exceptions). Crudely put, “compare and contrast” is too superficial a level of critical thinking to comprehend the true nature of problems – especially the big problems that affect people’s lives and livelihoods. In other words, learning critical thinking at the basic level is not sufficient, and it does not, for most students, reflect great acumen in critical thinking – especially if not practiced post-graduation. Let’s return to the image, above. The left side if often tainted by ideology and bias, which obscures the true nature of the problems. The right side is fact-based, making the true nature of the problem more apparent. However, in the real world, we recognize that some of what’s on the left side can creep onto the right side because humans are imperfect in their quest for truth. While the scientific method can inform humanities, the reverse is also true because it can help practitioners of the scientific method understand their biases and prejudices. The point here is that if we truly want to teach students how to read, write, and think critically, then we must also teach them structured problem-solving methods (e.g. PDCA, A3 Reports, A4 Failure Analysis, etc.). These methods must be repeatedly practiced in as many courses as possible across the curriculum. And then they must be regularly applied in practice, on-the-job. This also relates to job preparedness. Increasingly we see organizations of all types requiring employees to use structured problem-solving methods when they encounter problems, though it is unclear if leaders conform to the same requirement. It is also unclear to what extent this requirement eliminates the undesirable outcomes listed on the bottom of the left side of the image. In other words, there are right and wrong ways to use structured problem-solving methods. Education delivers value, but the value proposition can be strengthened and improved. One way to do that is to engage students in structured problem-solving in as many courses as possible to further develop their basic critical thinking skills, and then encourage them to apply what they have learned post-graduation. We should also draw upon research from the humanities to teach students about biases and prejudices that can be easily introduced into any kind of problem-solving process.